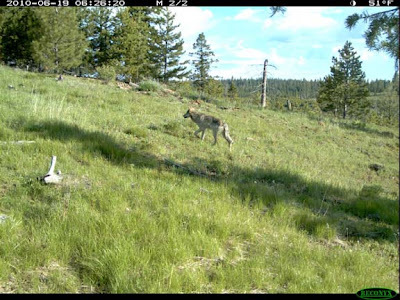 ---- Oregon Natural Desert Association: Wolves in Oregon – More Bark Than Bite? The Imnaha wolf pack has at least four new pups this year, images captured on a motion-triggered trail camera show. An image taken July 3 (attached) marks the first visual observation of new pups this year. The pack may have more pups than these four. Wolf pups are born in mid-April and litters average four to six pups. Pups generally become active outside their pack’s den in June. Six adult wolves were also seen in the images captured by the trail camera, including the alpha female. Past evidence, including a video taken November 2009, indicate at least 10 wolves made up the Imnaha pack before the pups were born this year. The alpha male, whose GPS collar has not been detected since May 31, was not seen in the images. 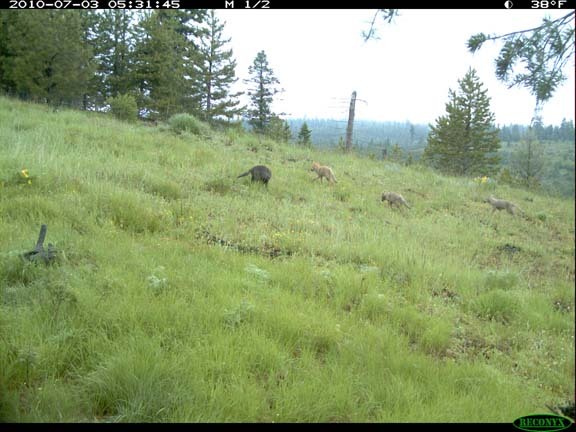 For more images of the Imnaha pack taken by a trail camera set up by ODFW in an area of pack activity, visit the website below (see first five photos). Note the alpha female is not pictured in these images. Throughout Western history, it has always been easier to shoot wolves than to live with them. Now, just as the first small packs of gray wolves are getting a toehold in Oregon, it is vital that this state not go back to the old way, the easy way, every time there is a conflict with wolves. There's just such a conflict now. The Oregon Department of Fish and Wildlife responded to several documented cases of wolf depredation on Wallowa County livestock by ordering the killing of two suspected wolves in early June. Conservation groups filed a federal suit in Portland challenging the kill permits, and a judge blocked the shooting of the wolves at least until July 31. We understand that Oregon cattle and sheep ranchers operate on terribly thin margins and face a long list of threats to their stock, including harsh weather, disease, coyotes, mountain lions and domestic dogs. It's too much to expect them to welcome another predator. Furthermore, it isn't fair that a small number of ranchers must shoulder virtually all of the costs, all of the burden, of returning wolves to Oregon's wild country. We are not against killing wolves that develop a taste for cattle, sheep and other livestock. Two such wolves, identified by their radio collars, were tracked down and killed not long ago, reducing Oregon's wolf population from 16 to 14. Those killings were justified. Moreover, we strongly believe that Oregon ought to have a tax-supported compensation fund so that all the Oregonians -- more than 70 percent by one poll -- who support the recovery of wolves in this state do their own small part to pay for the costs of bringing them back. But in the current case, Oregon seems too quick on the trigger and too willing to sidestep the sensible rules in its own recovery plan for gray wolves. Those rules generally require wildlife officials to document several wolf incidents on one or more adjacent ranches and clearly identify the targeted animals before issuing kill permits. That wasn't done in this case; about all that's known of the suspected wolves is that both are gray in color and neither one is wearing a radio collar. There are, of course, a lot of wolves that meet that description. While Idaho, Montana and Wyoming have spent years grappling with wolf issues, this is still relatively new territory for Oregon. Our state had the advantage of watching wolves re-establish themselves and saw how they have affected elk and deer herds and domestic livestock. Ranchers have learned in most cases to live with wolves and take common-sense precautions, such as burying animals that die of disease and other causes to avoid inadvertently baiting wolves onto their lands. Problem wolves have been killed by wildlife authorities. 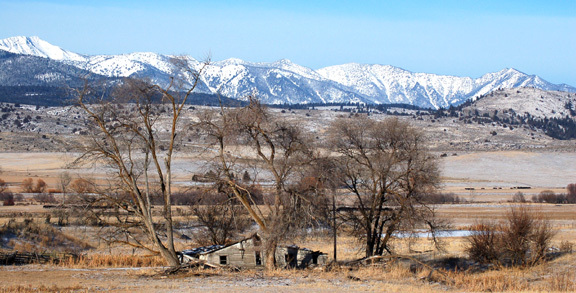 Ranchers elsewhere generally have been compensated for losses. After the first gray wolves swam the Snake River into Oregon beginning in 1999, a panel of ranchers, wildlife experts, hunters, Native Americans and others wrote a plan for how Oregon would respond to the arrival of wolves. It's not a perfect plan -- as we noted, it lacks a compensation fund for ranchers -- but it's a reasonably good one. And wherever and whenever one of Oregon's precious few wolves creates a problem, Oregon wildlife officials should adhere to that plan, rather than take the old way, the easy way, out. I agree on some points and disagree on others. I agree that shooting more wolves should have been blocked, and that they should not change the plan in a way that expands the area from that which documents "several wolf incidents on one or more adjacent ranches" and requires clear identification of "the targeted animals before issuing kill permits." I find some of the Editorial Board's conclusions more problematic. They say that "Those killings were justified" in reference to the Baker County wolves. Maybe so. But they should have also indicated that in that case, the ranch or ranches had also buried a carcass or carcasses too close to home ranch operations, and that besides poorly designed and pitifully inadequate protective fencing at the sheep operation in question, the state had removed usually effective defensive measures many weeks prior to the final attacks that initiated the kill order. Given the poor defensive measures (pathetic in some instances, and lack of actual onsite herding, care taking, or proper carcass burial practice in the more recent Wallowa County instances), it was preordained that serious attacks would occur. The wolves were "baited," inadvertently, or otherwise. It is, after all, in the rancher's interest to create hysteria about another predator that threatens their economic interest. As pointed out by the Hells Canyon Preservation Council, and the other groups, "In May and early June, six cattle deaths were confirmed as wolf depredations. For comparison, in 2005 — the year the wolf plan was created — domestic dogs killed 700 sheep and cows in Oregon, according to the National Agricultural Statistics Service. No new wolf depredations on livestock have occurred since June 4." The "tax-supported compensation fund" is just another subsidy to already highly subsidized ranchers (subsidies paid for by federal and state tax dollars that should be going to a higher public benefit, i.e., that which benefits more, hopefully the majority, of citizens.) Ranchers and others ventured into wolf country and shot all the wolves [see:Wolves Again. . . .] so they could utilize (and ultimately seriously damage) public ecosystems for private profit with their private enterprise grazing and browsing. The people have changed the priorities towards the health of their public ecosystems and the retrieval and restoration of native species. Just as I have to non-lethally protect my chickens, pets and plants from native and non-native predators (foxes, coyotes, domestic dogs, etc) and herbivores (deer) here in Baker City, so should ranchers in a restored wolf country be required to do the same. The plan, at a minimum, needs to maintain current protections, while requiring increased non-lethal protective measures by ranchers. There shouldn't be a double standard as to the burden for protection of one's property and animals from wild, and not so wild, life; i.e., one standard for ranchers, and one for the rest of us. Despite evidence to the contrary, in the form of dead sheep in Baker County last year and dead cattle this year in Wallowa County, we believe wolves and livestock can both thrive in Northeastern Oregon. But achieving that goal will require compromise. And not between wolves and their domestic prey. We’re talking about the relationship between the state and federal agencies responsible for managing wolves, and the coalition of groups that celebrate the return of wolves to Oregon after an absence of more than half a century. What happened last year in Baker County, when a pair of wolves killed more than two dozen livestock in Keating Valley, proves that that relationship can work. Although we’ll concede that that situation was more straightforward than what’s taken place this year in Wallowa County. In Baker County there was ample evidence, including photographs, linking the two wolves to the livestock kills. When those wolves, after being gone for most of the summer, returned to a ranch in Keating Valley and resumed their attacks on livestock, the Oregon Department of Fish and Wildlife (ODFW) authorized officials from the federal Wildlife Services to kill the two wolves. Federal workers did so in early September. None of the pro-wolf groups filed a lawsuit to block the federal hunters. This year in Wallowa County, wolves killed at least six cattle (some ranchers contend the tally is higher) in May and early June. There hasn’t been a confirmed wolf attack on livestock there since June 4. ODFW issued permits to Wildlife Services to kill two wolves. The permits are effective through Aug. 31. Although no wolves have been killed, a quartet of conservation groups on July 1 sued Wildlife Services, accusing the agency of not fully studying the effects of killing two wolves. Wildlife Services responded the next day by voluntarily agreeing to not kill any wolves until Aug. 1 at the soonest. And that’s where the tenuous ceasefire stands. The plaintiffs posed a valid question: Would killing two wolves now, this month, save any livestock in Wallowa County? It makes no sense to kill wolves if doing so is not necessary to protect domestic animals. However, absent permission from ODFW, federal hunters can’t deal with the Wallowa wolves should they suddenly regain their taste for beef. That, too, is unacceptable. The key issue in this situation, ultimately, is trust. Specifically, whether wolf advocates trust that ODFW, even accounting for its decision to issue wolf-kill permits, is committed to enabling wolves to re-establish a healthy, sustainable population in Oregon. Based on the recent lawsuit, it seems that trust is lacking. But what we’ve seen leads us to believe that ODFW truly intends to seek a balance not only between wolves and livestock, but also between wolves and game animals such as elk. The return of wolves to Oregon was never going to be harmonious. But consensus is possible, as last year’s events in Baker County proved. Such consensus will prove elusive, though, if wolf advocates file lawsuits when the only animals that have been killed are livestock. The Herald says that they think "wolves and livestock can both thrive in Northeastern Oregon." OK. Their are several interested parties from whence compromise might come if warranted. These include, the ranchers, the enviros and wolf supporters like myself (In another article below, Bruce Fenty, ONDA Exec. Director, points out that Oregon polls show "70% of people are in favor of wolves returning to Oregon" and I might add, millions of others across the nation. ), hunting interests (mostly within the state of Oregon), as well as the federal and state agencies that manage wolves and their suitable habitat. "We’re talking about the relationship between the state and federal agencies responsible for managing wolves, and the coalition of groups that celebrate the return of wolves to Oregon after an absence of more than half a century." Notably absent from the Herald's "compromise" are the ranchers, who absent any interest in increasing their own investment in non-lethally protecting their own livestock, stand to suffer personal losses and increased expense if wolves are successfully reintroduced. Is this realistic? How can the Herald reach the conclusion that such a major player and obstacle to successful reintroduction should be excused from any "compromise?" They, after all, were the motivation and major players in the original extirpation of wolves from Oregon. Getting rid of the wolves helped them create an environment where they could turn their livestock (except for sheep, who are normally herded) out in the spring, sans supervision, and collect them in the fall, without losses due to wolves. Something will obviously have to change with the reintroduction of wolves to their rightful place and their necessary ecological role as an apex predator. That something is that ranchers are going to have to start looking after their livestock with active herding and the implementation of non-lethal controls and other non-lethal measures. That is the the part of the compromise that is mysteriously missing from the Herald's equation. "In Baker County there was ample evidence, including photographs, linking the two wolves to the livestock kills. When those wolves, after being gone for most of the summer, returned to a ranch in Keating Valley and resumed their attacks on livestock, the Oregon Department of Fish and Wildlife (ODFW) authorized officials from the federal Wildlife Services to kill the two wolves." What the Herald leaves out is that they returned to the pitifully unprotected sheep operation several weeks after the quite often effective non-lethal measures had been removed. Why would the Herald leave that fact out? "None of the pro-wolf groups filed a lawsuit to block the federal hunters." So . . .(bleep) what? Are we supposed to conclude that because regional "pro-wolf" groups didn't file suit concerning the first two killings of young wolves in Baker County, that the killings of set-up young wolves by the Feds were OK or that the "pro-wolf" groups don't care? One could easily conclude something quite different, but due to the lack of other relevant information or logic, it would be just as meaningless. Any conclusion based on that the single fact that they didn't file suit, such as they didn't file suit because they are chronic compromisers, or politically weak, or inept strategists, or underfunded, underpaid, overwhelmed, and otherwise broke, would be just as baseless without additional information. "It makes no sense to kill wolves if doing so is not necessary to protect domestic animals. However, absent permission from ODFW, federal hunters can’t deal with the Wallowa wolves should they suddenly regain their taste for beef. That, too, is unacceptable. Based on the recent lawsuit, it seems that trust is lacking." Trust? Well . . ., of course it's lacking--that's why the groups filed suit. When the agencies quit working for the ranchers with taxpayer money so as to help the ranchers evade responsibility, there will be a chance to develop trust. As for the part about killing wolves to protect domestic animals, that just ignores a core portion of the problem. The reason they want taxpayer funded agencies to kill wolves, is because they refuse to shoulder the responsibility and expense of protecting their livestock with non-lethal measures (as the rest of us are required to do). ". . . consensus will prove elusive, though, if wolf advocates file lawsuits when the only animals that have been killed are livestock." "Four conservation groups sued the U.S. Department of Agriculture’s predator control branch, Wildlife Services, today for its role in killing wolves at the behest of the Oregon Department of Fish and Wildlife (ODFW). The state has issued, and now extended to Aug. 31, a permit to the federal agency to hunt, track and kill two wolves across a 70-square-mile area in eastern Oregon. According to the conservation groups’ lawsuit, Wildlife Services never conducted the environmental analysis required to disclose the impacts of killing a substantial portion of Oregon’s wolves. Cascadia Wildlands, Hells Canyon Preservation Council, Oregon Wild and the national Center for Biological Diversity brought the suit, and are also strongly considering suing the state for its role in authorizing the kill permits." While the Herald's editorial seem like a case of fuzzy thinking, what is clear to me is that they can't go wrong in Baker County sheep & cow country when they excuse ranchers from compromise and place the blame on environmentalists and the agencies for problems in achieving so-called 'compromise" & "consensus." 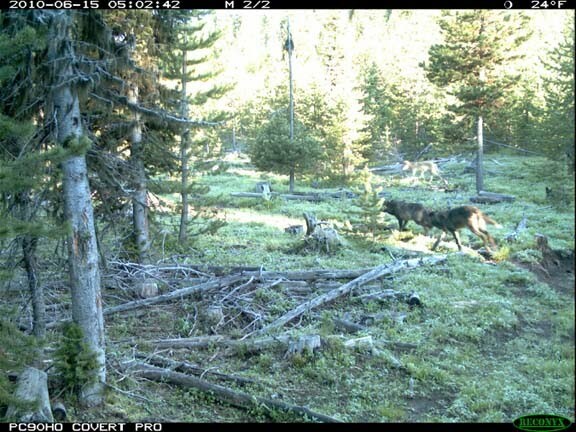 Wolves in Oregon – More Bark Than Bite? "Oregon’s Wolf Management Plan is currently under a 5-year review to determine the future of wolf populations. Over the past century, the gray wolf (Canis lupus) has borne the brunt of man’s attempt to dominate the wild west. For example, wolves were extirpated in Oregon in 1946 after decades of over-hunting fueled by State-paid bounties for every wolf hide. Over the past several decades, Americans have grown to understand that the recovery of wolves is essential to ecosystem health and to restoring our wildlands. As Aldo Leopold once commented, “Harmony with the land is like harmony with a friend. You cannot cherish his right hand and chop off his left. That is to say you cannot have game and hate predators. The land is one organism.” As such, the gray wolf was put on the federal Endangered Species List in 1974, and since then efforts to re-establish wolf populations have led to wolves now being found in Montana, Wyoming, Washington, Idaho and, recently, Oregon. As you may recall, the first known gray wolf to return to Oregon was a female that migrated from Idaho in 1999 but she was quickly returned to Idaho by the Oregon Department of Wildlife (ODFW). In 2002, ONDA successfully petitioned the ODFW to comply with State law and create a state Wolf Management Plan. This plan was completed in 2005, and set a goal of 5– 7 breeding pairs in the State before the has only two documented breeding pairs which are located in the northeast corner of the State. While polls in Oregon have shown that 70% of people are in favor of wolves returning to Oregon, there is a vocal minority objecting to the re-establishment of viable wolf populations. The Oregon Cattlemen’s Association has all but declared war on wolves in Oregon, recently stating that “wolves are terrorizing eastern Oregon.” The underlying argument is that wolf populations will threaten livestock. However, Oregon produces 1.5 million head of cattle annually and so far there have been only six cattle deaths from wolf predation. In response to these conflicts, ODFW recently issued kill permits for an area spanning nearly 40 square miles; such action bears an unfortunate and uncanny resemblance to Oregon’s unsavory past efforts which led to the extermination of wolves. Some conflicts between livestock grazing and native wildlife such as wolves are unavoidable particularly given the fact that the vast majority of our public lands are grazed by livestock. Conservation groups have worked to find ways to address such conflicts with wolves. For example, Defenders of Wildlife set up a fund to reimburse ranchers for livestock lost to wolf depredation, and since the establishment of this fund it has paid out $3,900 to Oregon ranchers. Another option would be to permanently or temporarily retire grazing permits on public lands where conflicts between wolves and livestock exist. Regardless, ranchers, as outlined in the Wolf Management Plan, must take responsibility for the safety of their livestock by improving inventory, fencing and employing fladry lines or other non-lethal hazing tactics to scare wolves away from livestock. Ultimately, wolves need to be treated as native wildlife – not as unwanted predators. A draft of the revised plan should be available by September and we have joined Hells Canyon Preservation Council in commenting on proposed revisions. A public meeting will be held in Bend on October 1st and ODFW will be making its recommendations for the Wolf Management Plan. I encourage you to attend this meeting and become involved in the protection of wolf populations in Oregon. In the meanwhile, keep an eye on your inbox for email updates on the Wolf Management Plan and please don’t hesitate to contact staff for more details on how to support wolf recovery." Wolves Again. . . . This is a in part a re-post of a blog from December 6, 2007 about wolves and the persecution of predators. What's With Obama's Top Political & Economic Advisor's? David Axelrod was on the Diane Rehm show this morning – a great opportunity to connect with listeners who will actually stop what they are going and pay attention, at least for a short while. He was awful. He had even the most basic facts wrong – it’s not “8 million people have lost their jobs” but rather “more than 8 million jobs have been lost” since December 2007. He rambled – it was hard to see his point, particularly in the introduction. But most of all, there was no narrative – why exactly did we have a recession, why has it been so bad, and why aren’t the jobs coming back? Without a narrative, how can anyone make sense of the past 18 months? There was really no explanation for why the economy has become such a difficult place for so many people. How did we go from apparent prosperity in 2007 to the deepest recession of the past 50 years? And how are we going to get the jobs back? Blaming things on the Republicans in some vague sense (e.g., tax cuts) also doesn’t make sense to people. If you want to get partisan, you have to connect the dots in a convincing manner – otherwise people will (rightly) tune out. Does the problem here lie with the economic briefing that Axelrod received before going on air? If so, changing those responsible would be an obvious first step. In modern American life, Treasury Secretary Tim Geithner stands out as amazingly resilient and remarkably lucky – despite presiding over or being deeply involved in a series of political debacles, he has gone from strength to strength. After at least eight improbably bounce backs, he might seem unassailable. But his latest mistake – blocking Elizabeth Warren from the heading the new Consumer Financial Protection Bureau – may well prove politically fatal. Geithner was a junior but key member of the US Treasury team that badly mishandled the early days of the Asian financial crisis in 1997 and received widespread criticism (Life #1). He was promoted as a result and thereafter enjoyed a meteoric rise. As President of the New York Federal Reserve from 2003, and de facto head of the government’s financial intelligence service, he completely failed to spot the problems developing in and around the country’s financial markets; nothing about this embarrassing track record has since stood in his way (Life #2). He subsequently became Hank Paulson’s Wall Street point person for one of the most comprehensively bungled bailouts of all time – the Troubled Asset Relief Program, TARP, which in fall 2008 first appalled Congress with its intentions and then wasn’t used at all as advertized (Life #3). TARP and related Bush-Paulson-Geithner efforts were so completely and clearly unsuccessful in October/November 2009 that the crisis worsened and Geithner was offered the job of Treasury Secretary by President-elect Obama; the incoming team felt there was no substitute for “experience”. Nevertheless, he almost failed in the confirmation process due to issues related to his taxes (Life #4) and then stumbled badly with his initial public repositioning of the TARP (Life #5), which was going to buy toxic assets again but in a more complicated way (perhaps his most complete and obviously personal political disaster to date). His next Great Escape was the stress tests in spring 2009 – it turned out, supposedly, that there was really no financial crisis. Most of the big banks really did have enough capital; all that had been missing was the government’s endorsement of this fact (this is the story, honest). If this seems too good to be true, look at the mass unemployment still around you and tell me if the financial sector really looks healthy (Life #6). Life #7 was expended concurrent with the forceful arrival on the financial reform scene of Paul Volcker. The Geithner-Summers “financial reform” package from summer 2009 was weak to start with and weakened further as it was discussed in the House; the entire effort was rudderless. Volcker’s new proposals helped rescue the reform and restore momentum – but instead of (appropriately) discrediting the Geithner approach in the eyes of the White House, it actually helped the Treasury Secretary climb new pinnacles of influence. Go figure. Life #8 is the blatant failure of the Geithner strategy to “just raise capital requirements” as the way to deal with distorted incentives and the tendency to take irresponsible risks at the heart of our financial system. Treasury insisted on “capital first and foremost” throughout the Senate debate this year – combined with their argument that these requirements must be set by regulators through international negotiation, i.e., not by legislation. But the big banks are chipping away at this entire philosophy daily through their effective lobbying within the opaque Basel process – as one would expect. The latest indications are that capital requirements will barely be raised in any meaningful sense. Secretary Geithner likes to say, “Plan beats no plan” and in some positive interpretations this is the secret of his success. But it turns out that he had no plan really – the stress tests were a grand improvisation (ultimately implying scary sized government implicit guarantees), the initial financial reform proposals fizzled (the Volcker rescue was against Geithner’s wishes), and the much vaunted tightening of capital standards is completely illusory (doesn’t anyone in the White House read the newspapers?). On top of all this, it now appears that Secretary Geithner will oppose Elizabeth Warren becoming the new chief regulator responsible for protecting consumers from defective financial products – despite the fact that she has led the way for this issue, on both intellectual and political fronts, over the past decade. The financial sector has abused many of its customers badly over the past decades. This simply needs to stop. Throughout the Senate debate on financial reform, Treasury insisted that complex details regarding consumer protected need to be left to regulators – and thus the Geithner team pushed back against many sensible legislative proposals that would have tightened the rules. Treasury also promised – although in a nonbinding way – that the new generation of regulators would be an order of magnitude more effective that those who eviscerated whatever was left of our oversight system during the Bush years. Tim Geithner is sometimes compared to Talleyrand, the French statesman who served the Revolution, Napoleon, and the restored Bourbons – opportunistic and distrusted, but often useful and a great survivor with a brilliant personal career. In the end, of course, no one – including Talleyrand – proves indispensible. And everyone of this sort eventually pushes their luck too far. If the Democratic leadership really wants to win in the November elections, they should think very hard about the further consequences of Mr. Geithner. - Reducing the annual cost-of-living adjustment. It calculates the implied cut in benefits and projected income for various age groups and income quintiles of retirees and near-retirees. "Since the vast majority of near-retirees will rely on Social Security for the vast majority of their income in retirement, cuts in Social Security imply large cuts in income for a population that is already not especially wealthy. (Median household income for people over age 65 is less than $30,000.) Ironically, the drive for these cuts is being driven by budget problems resulting from the collapse of the housing bubble. This is a disaster for which older workers were the primary victims, since they lost the most equity in their homes." Collecting Social Security At 70?